Often misrepresented in official data, second largest immigrant community in New York City endures painful work conditions. Feeling invisible in a restless metropolis like New York City is not uncommon, but for the nearly 650,000 South Asian immigrants living here this is closer to a general notion. South Asians were 23% of the estimated two million immigrants working in New York in 2010, the second largest migrant community after Latinos (27%). Nevertheless, current statistics on them paint a blurry and often inaccurate picture, especially when it comes to the labor market. A report published on Wednesday sheds some light on the way Bangladeshis, Indians, Pakistanis and Nepalese (the four largest national groups within the community) are getting by in New York. According to Desis Rising Up & Moving (Drum), the grassroots community organization that conducted the survey, this is the first study in New York ever to focus on working conditions for south Asian immigrants. “We are the basement people,” said Kazi Fouzia, 44, a Bangladeshi retail worker who immigrated four years ago. She said most low-wage south Asian workers usually live in basements, because that’s the the only kind of apartment they can afford in New York. Fouzia pays her Indian landlord $200 a month for an underground room in Jamaica, Queens, 90 minutes away from the clothing store in Jackson Heights where she makes $4 an hour. The findings in the survey point to an exploited, underpaid and often harassed workforce, a situation that only worsened after the 9/11 terrorist attacks since many south Asians are Muslims – and those who aren’t are usually taken for Muslims by police officers during stop-and-frisk operations, they say. “Our experience over the last 12 years taught us that low-wage people are the ones who have borne the weight of racial profiling after 9/11,” said Monami Maulik, the India-born, Bronx-raised founder and executive director of DRUM. The report is a result of 18 months of research and hundreds of interviews with workers in Jackson Heights, Queens, a traditional South Asian hub in the city. More than half of the respondents make less than the minimum wage of $7.25 per hour, 83% in the case of retail employees. The huge majority (95%) doesn’t have any type of health insurance, and only one fifth of them gets paid for sick days (when almost half of New Yorkers do, in comparison). “Our healthcare is called Tylenol,” said Fouzia, in reference to the over-the-counter painkiller. Two years ago, she was working on Christmas Day for $4.50 an hour when she got hit by a car while crossing the street to get something for her boss. Fouzia fractured her arm and shoulder in six places, but her boss forbade anyone from calling 911 and fired Fouzia the next day. All she could get from the hospital, where she was taken after one of her co-workers finally managed to call a cab, was a box of painkillers. 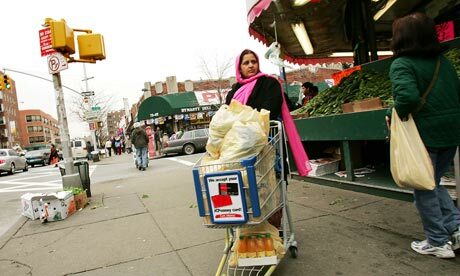 South Asians also earn around $5 less in comparison with the average low-wage worker in New York. The deepest gap was found among construction workers, who earn $16.43 less than the average. At least 65% of respondents told researchers they work more than eight hours a day, while 40% work more than five days per week. P, a 40-year-old mother-of-two who moved to New York from Bangladesh in 1999 but wished to remain anonymous, works 13 to 14 hours a day, six days a week, to pay for her two-bedroom basement in Corona, Queens. Her husband sells candy in a small shop inside a Manhattan subway station. She said both of them work hard to be able to afford good education for their children – her 20-year-old daughter is currently attending college and wants to become an architect. P’s main complaint is the treatment she receives from her boss. “He talks to me like I’m a mental patient. When he eats, he throws food on the floor and yells at me to clean it,” said P.
According to the report, one in five workers mentioned workplace harassment, while two out of five retail workers said they are not allowed to take breaks. However, undocumented workers rarely speak out about being abused for fear of deportation and retaliation against their families. Shaharazade Thompkins-Lewis, a Community Outreach and Resource Planning specialist from the New York City District Office, said the US department of labor helps workers despite of their immigration status – the problem is that few immigrants know that, and their bosses take advantage of this to intimidate and keep them working under such bad conditions.